Choose from a great selection of international cuisine at the October Gallery Café Set within the October Gallery, the café provides an ideal place for a meal while enjoying the gallery's range of contemporary art including sculptures, paintings and multimedia. Do you work at October Gallery Cafe? 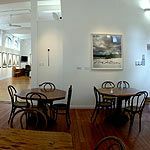 What did you think of October Gallery Cafe? I know everyone goes on about The Tate and The National Gallery, but I love the October Gallery. It’s small, cute and has some great contemporary art to look at. October Gallery also has a cute little café too.